Click on the link to redirect to Lisa Hill’s book blog ANZ LitLovers. Students, click this link to go to the LisaHillSchoolStuff Wiki. Well, I’ve finally bitten the bullet and taken retirement. It’s been a great career, but the time has come! This means that the LisaHillSchoolStuff blog is retiring too. I don’t intend to add any new content or reviews, and I won’t be responding to comments, but I won’t be deleting the blog in case readers still find it useful in some small way. I will, however, still be blogging away at the ANZ LitLovers blog, where you can find reviews and news about Australian and international contemporary and classic literary fiction. Thank you to everyone who’s supported this blog by taking the time to comment or subscribing to it. This affirmation is what has kept me going when I sometimes felt that nobody was reading it at all! Alfie’s Big Wish is a sequel to Alfie’s Search for Destiny which I reviewed on this blog last year. It’s another title from Magabala Books, the indigenous not-for-profit publishing company based in Broome, Western Australia, and again the story is written in rhythmic rhyming couplets. This time Alfie is in search of a friend. This is a common theme in books for young children, and increasingly as families become more mobile and divorce is more common, the theme features a treasured friend moving away, leaving the other child bereft. leaving him lonely, leaving him sad. The other kids who are still around are older than he is and the things he used to do with his friends are suddenly no fun anymore. Appropriately in books for this age group the problem is reassuringly resolved when Alfie makes a wish upon a star and a little friend emerges from the bushes the next morning. While this is a sweet little book for pre-school children, it has value for older students too. As I explained in my previous review, David Hardy is an indigenous freelance artist descended from the Barkindji people of Brewarrina, NSW. He worked for eight years with Walt Disney Studios in feature film animation, and has now come home to live in Sydney. Hardy’s success in a high-profile international arena makes him a great role model for students of any background, but especially for indigenous students who are so often subjected to negative stereotypes of their people. While he was with Disney, Hardy worked on The Lion King 3: Hakuna Matata, Tarzan II, Lilo and Stitch2 and Return to Neverland. He was also ‘clean-up animation director’ in Manila, Philippines, where he worked on The Little Mermaid: Ariel’s Beginning and The Fox and the Hound 2. Older students will immediately identify the classic Disney facial expressions and gestures in the Alfie series of illustrations, while also identifying the symbols of indigenous identity such as the red and ochre head and arm bands; the boomerang; the face painting and the dancing. The clever way that Hardy has adapted his ‘Disney’ style for the indigenous Australian context provides the opportunity to talk about career possibilities in animation and other forms of digital art. I also use it to encourage students not to slavishly copy the pop art and Manga that they come across, but to adapt it and make it their own. Robert Ingpen was an inspired choice of illustrator for this delightful book, Tea and Sugar Christmas by Jane Jolly. Awarded the Hans Christian Anderson in 1986 for his lasting contribution as a children’s book illustrator, Ingpen has transformed a simple Christmas story about outback life into a work of art that teachers will love to share with their students at any time of the year. Teachers in metropolitan areas know that it’s not easy to convey a sense of the outback to urban children. But the cunning design of this book does it well. Each page of text is accompanied by a B&W drawing of the characters in the story, but it opens out to reveal a double page colour spread of the landscape and of the train which brought goods and services to the remote Aussie outback until as recently as 1996. And so we see little Kathleen holding an empty tin of tea on the first page, which then opens out to the muted colours of the small settlement where she lives, the town bisected by the all-important railway line. Katherine slid down the hill and ran through the drowsy town. She burst inside. ‘It’s coming! It’s coming!’ she shouted. Dad looked up and his eyes danced a jog. ‘At last, more tea and sugar,’ said Mum, from the end of a paper chain. Kathleen grabbed the wheelbarrow and started running with it. Her feet pounded the hot track, searing like scones on a griddle. She could hear the screeching of the train as it pulled into the siding. As she ran, others emerged from their tin castles, cheering and calling out across the shimmering landscape. The portrait of Kathleen when it’s her turn to see Father Christmas is stunning. Just beautiful. At the back of the book there are photos accompanied by historical information about the train, including the migrant men who worked on it after World War II, and the way that the people dressed up to meet it because it was the highlight of their week. The endpapers are used to show a map of the route. As a window onto a vanished lifestyle, Tea and Sugar Christmas is brilliant. This book is almost too beautiful to let into the hands of small children! 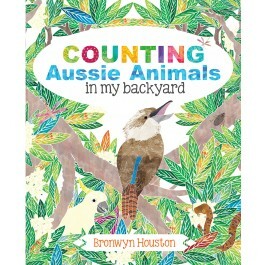 It’s a simple 1-10 counting book designed for pre-schoolers so there are two kookaburras laughing on the fence and five cockatoos squawking in the trees, and so on – but the illustrations are so stunning, most adults would be happy to have them framed and hanging on the wall. The colours are so vivid they almost take your breath away. Little kids will love locating the creatures and talking about where they can be found in their own backyards. (Well, maybe not the python!) This would make a lovely Christmas gift for toddlers and pre-schoolers – just make sure that they have clean hands and don’t spoil the gorgeous artwork! As all good books by indigenous authors do, the book includes biographical information about the author. Bronwyn Houston is descended from the Nyiyaparli and Yindjiparndi people of the Wana clan in the Pilbara region of Western Australia. She lives in Broome and draws her inspiration from the local landscape and the Kimberley region where she was born. But I also discovered from Google that Bronwyn also works as a graphic designer and photographer, and you can buy her designs at Red Bubble. You can find some of her other books at Fishpond, including My Home Broome reviewed here a little while ago. 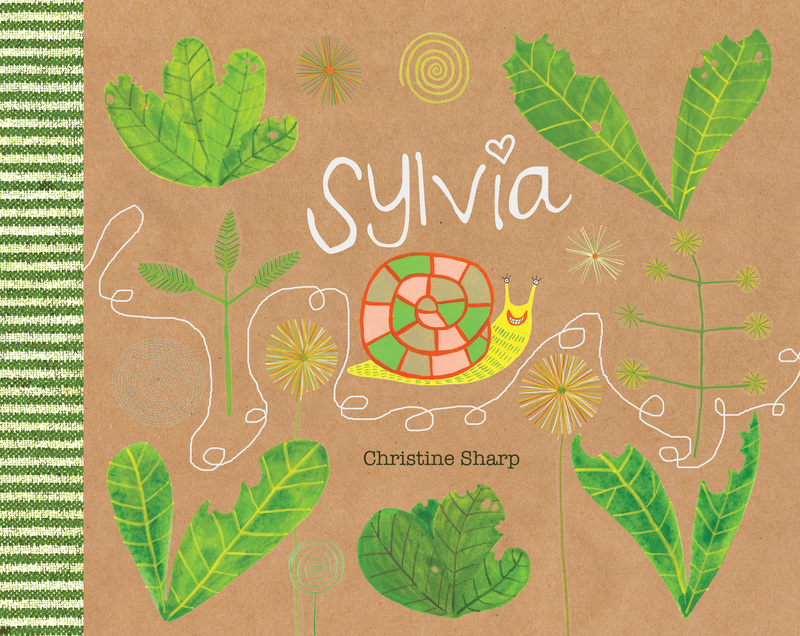 Sylvia is a delightfully daft picture book about the unrequited love of … a snail. Yes, Sylvia is a snail who is in love with Simon Green and his vegie patch: his luscious lettuce, choice cucumbers and buttery beans. Needless to say, he is not so enamoured of her! Have a look at the sample pages on the UQP website to see Sharp’s brilliant illustration of his enraged face bellowing GET OUT! at her, and it is just possible that even if you are a grower of vegetables yourself, you may feel a tinge of empathy when you see her slide away and shrink into her shell, sobbing her little heart out for love of Simon. What to do? Well, with her shimmering trail she writes Simon a love letter, but Simon is aghast when he sees the damaged kale and the nibbled tomatoes. He’s an organic gardener who sells his produce at the farmer’s market – and he knows how fussy customers are. (I don’t understand why people would rather buy an unblemished over-sized strawberry that tastes like water instead of a small flavoursome one, but then, I don’t understand why people eat processed food and junk food either). But to Simon’s surprise – and the amused reader’s too – Sylvia finds a way to make a public declaration of her love, and it turns out to be the best kind of advertising he could possibly have. Love blooms in all kinds of unexpected ways, eh? You can download teacher’s notes from UQP. 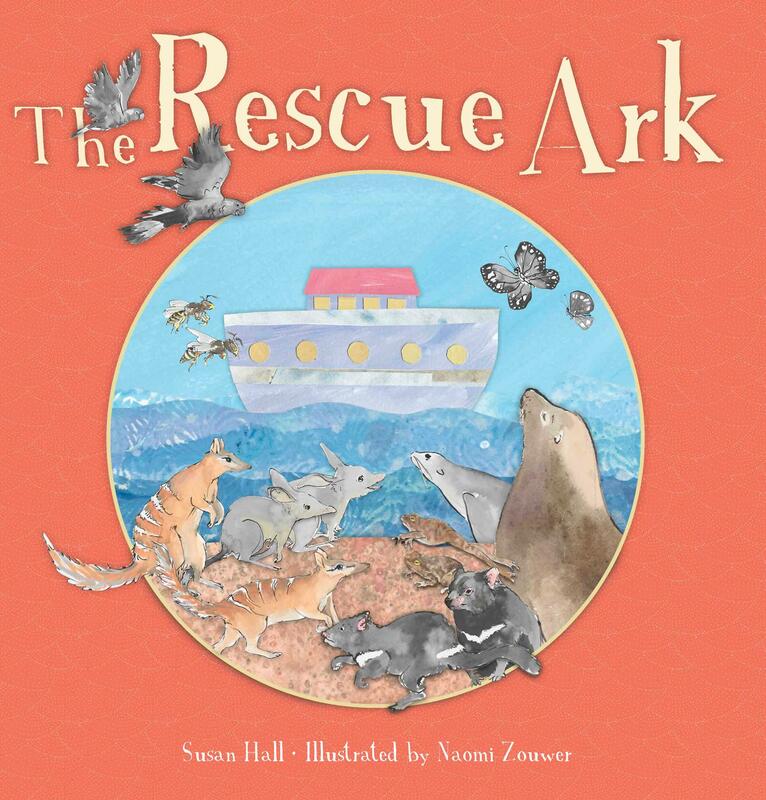 The Rescue Ark is a delightful picture book pitched at raising the environmental awareness of young children. While the allusion to the Biblical Ark is made obvious by the illustrations, it’s not a vengeful Old Testament God that the animals need to be rescued from, but rather from their own habitats which have been fouled by pollution. Told in occasionally slightly awkward rhyme, the book shows endangered animals clambering, whooshing and grumbling their way onto the Ark, some (as you’d expect) in less orderly fashion than others. The animals are mostly charismatic cuddly creatures, with cute little faces rendered in slightly muted primary coloured collages by talented artist Naomi Zouwer. The Ark’s passengers include wombats, potoroos, numbats, quolls, bandicoots, bilbies, Tasmanian devils, wallabies and possums; while amongst the flying creatures there are butterflies, parrots and cockatoos. In the less adorable but likewise endangered category there are bees, snakes, lizards, frogs and turtles, not to mention a river mouse that looks much more like a rat. For the adult, there are zoological notes at the back which explain the conservation status of the animals, and there is a map so that the route of the Ark around Australia can be traced as the animals board it. Some of the illustrations for the zoological notes are images from the National Library’s Rare Books Collection and they include pictures by the likes of John Gould, while others are the work of contemporary wildlife photographers. Ideally suited for pre-school and prep children, the book concludes with the empowering message that the animals return to their homes when Aussie kids have cleaned up the environment. This title would be a nice one to include in any units of work about Australian animals. For another review, see Kids’ Book Reviews. Source: Review copy courtesy of the NLA. Or direct from the NLA bookshop.